We are having two guest lectures in the Seeing and Knowing theme by authors on the reading list. 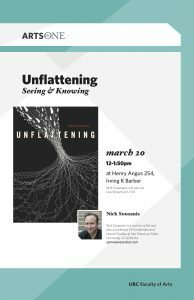 The first one is by Nick Sousanis, author of the comics work Unflattening, who will be joining us remotely, via videoconference. That will be Monday, March 20. The lecture will start as usual at noon, and Nick will be joining us starting at 1. We’re excited to having him lecture for us! Nick will also be coming to the UBC campus in person for a couple of events the first week of April. Stay tuned for information on that!